How can you truly evaluate price quotes when comparing estimates when there is more involved than just the bottom line? Arcahdeck of Columbus urges homeowners to be leery of builders who don’t reveal all the facts or a final price point when choosing an outdoor structure builder. Let Archadeck of Columbus open the door to your outdoor living imagination and build you the highest quality outdoor space imaginable. I recently met with a homeowner here in the Columbus area who was gathering the standard “three price quotes” for a proposed deck addition he was considering. The homeowner was weighting having their home builder build their deck or having Archadeck of Columbus build their deck. In a custom outdoor project such as a deck, there really is no way to compare the specialized quality we provide with the quality from someone who is not specialized in the field of our expertise. On a custom project, almost every variable is going to be different. Comparing a specialized builder to a general contractor is like comparing apples to oranges. Instead of providing estimates or bids for our projects we actually provide the price the project will cost. Falling into the trap of depending on the estimate for the bottom line is where many homeowners place too much trust. An estimate is just that. It’s an estimate of what the job can cost which in most situations increases by the time the project is completed. A bid submission works a lot like an estimate whereas the project will be submitted to many companies which results in being priced out based on building projects, material and labor. As we all know material costs can vary from the time the bid is submitted to when your project is completed as can the cost for quality labor. We are a custom design and build company and our goal is to provide homeowners with a bottom line price on what a custom job entails. There are no estimations, no hidden costs, and most of all no surprises once your project is completed. Taking all this into consideration, how does one make an informed comparison when comparing companies whose materials and building methods are not the same? The truth is you can’t, because there is no comparison. Our clients receive detailed plan prints showing their anticipated space from every angle. Archadeck of Columbus believes it to be in our best interest to provide the best information to our prospective clients so they can make an informed decision on their own. When we provide a price to a homeowner, we provide the details of the chosen materials, the colors choices, and even the bolts and fasteners used during installation. 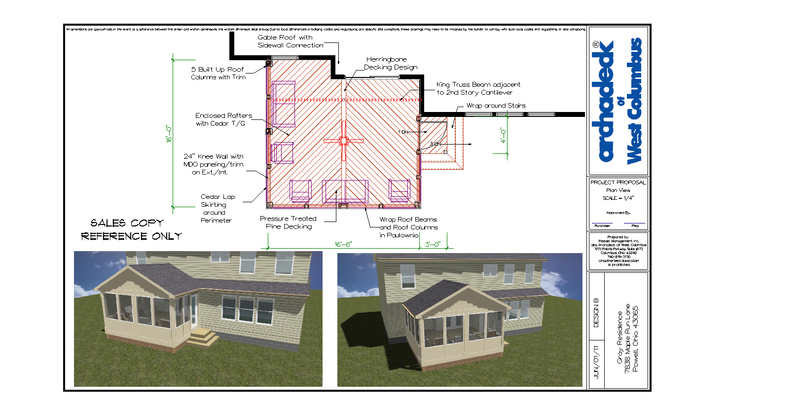 We also show homeowners the computer aided rendering of a proposed project in order to see all the specified materials and colors involved in the project. Our contract checklist outlines all the value you are getting at no extra cost to you. In order to ensure you are getting a fair shake when compiling price quotes for your upcoming outdoor living project, we suggest looking at what materials will used in your project. Synthetics for example, are available in different price ranges. If a contractor is using inferior materials or unspecified synthetics, then it is difficult for a homeowner to make an informed decision. Another area to look over really well is what kind of building practices the company has. Are they drawing your proposed space on paper only showing a one-dimensional view? If this is the case how are you supposed to know what you are really getting? Does your design even look the same as what you asked for? These are all subjective items homeowners should consider. Always look at the value and determine whether you are getting the level of details and trim with one company versus another. Ask yourself if the details when comparing are the same and if not find out how they differ and how important that is to your project and why. For example, what kind of fasteners do they use? Why does one company price your project including hidden fasteners and the other nails? Always be leery of a price quote which provides scant details. Also be careful of many subjective areas where the builder can interpret these areas on his own. Always review the contracts between companies and gain an understanding of what they truly are. Remember that a good contractor will explain it to you openly and not try to hide anything from you. Our technology allows you to see exactly what is going to be built. Our price quotes include details that are specified down to the last bolt and fastener we plan to use on your project. That is how we have always conducted business, and we will continue to do so because we put our customers first. 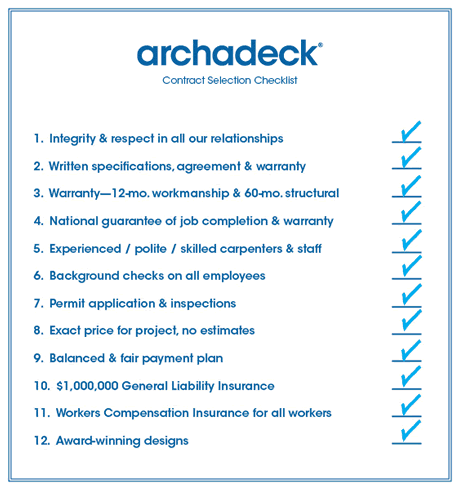 Contact us to learn more about the benefits of choosing Archadeck of Columbus for your outdoor living addition. Please visit our decks photo gallery and our outdoor rooms photo gallery located on our website to see more examples of our superior outdoor structures. 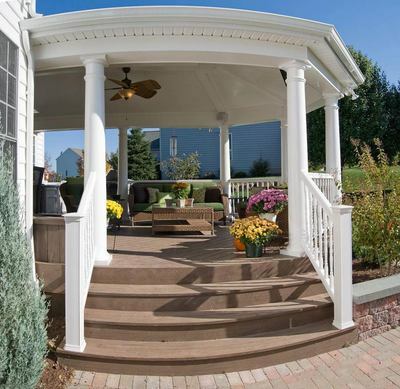 Previous Previous post: Trending now – building a screened porch over your Columbus, OH patio.